The location of this scene painting is Pirates Cove at Corona del Mar beach in southern California. The exact view is looking toward Catalina Island from Lookout Point. In the mid area of the painting where the sailboats are located, is the seawater channel entrance to the Newport Harbor and Balboa Bay. This was one of the artist’s favorite places. His visits to this spot dated back to childhood when his family spent summers at a nearby beach house where he would hike up the hill and sit for hours enjoying the marvelous view. Throughout his life he returned to this place for artistic inspiration. As a young man Dike was enamored with paintings by George Bellows and even went to New York City where he studied with George Luks at the Art Students League. To some degree this work shows how a California Scene painter carefully studied certain aspects of the New York City Ash Can School and applied the approach to creating art that captured scenes of everyday life in California. Very few artists attending art school in California in the 1920s were interested in the lush, romantic landscape painting that had dominated California art for the previous thirty years. Instead, they looked to the work by California artists dating back to the period of 1850 to 1880, when the state was forming. Some of the most interesting capture daily routines in the gold mining camps and street scenes in busy downtown San Francisco in the 1870s. Those works alongside the art of George Bellows and the Ash Can School served as inspiration for a new generation of artists interested in taking California art in another direction. Conscious that their art would be a visual chronicle of the California of their times, these artists produced works that captured scenes of everyday occurrences drawn from personal experience (Fig. 1), mundane rural life (Fig. 2), or inner cities. Images of the latter were often of engaging subject matter showing evidence of humanity by including automobiles, buildings, trains, highways, and all other types of manmade structures (Fig. 3). When these works were first exhibited in the late 1920s, it was clear that these artists, such as Millard Sheets, Phil Paradise, Phil Dike, and Ben Messick, were breaking new ground. Regularly exhibited by 1932, their images began to be referred to as California Scene Paintings, a term first used by Los Angeles Times art critic Arthur Miller. From the 1930s to 1960s, large numbers of California artists focused their careers on producing representative art (Fig. 4); this period has become known as the golden era of California Scene Painting. Ranch Near San Luis Obispo, 1935. Oil on canvas, 28 x 34 inches. On several occasions Phil Paradise traveled to Central California where he followed the haying operations and visited a number of working farms and cattle ranches. While viewing these activities he produced location sketches and value studies of what he saw. Returning to his home in the Los Angeles area Paradise produced oil paintings, watercolor paintings, and lithographs of what he saw and experienced. During the time Paradise produced this work he was studying works by the Old Masters. The dramatic shadows and light (chiaroscuro) in this work reflect those studies. Fig. 3: Charles Payzant (1898–1980), Wilshire Blvd., 1936. Watercolor on paper, 19 x 24 inches. Private collection. Charles Payzant was one of the first artists to convert his skills honed while working Disney animated cartoons into producing fine art watercolor paintings. Many of his finest works featured scenes of the Los Angeles cityscape. The section of Wilshire Boulevard depicted in this watercolor was specifically developed to cater to the California car culture, which was rapidly developing during the 1930s. Simmons Drive-In restaurant with car hop service was a very popular spot. The tall, thin building is a classic Art Deco structure. Designed and built as a Bullocks department store, it is reported to have been the first store in Los Angeles to build a parking lot and to offer valet service. Bullocks Wilshire was the store of choice for the rich and famous of Hollywood and Beverly Hills. Payne did not drive a car at this time and was using public transportation to go to and from her home located off Sunset Boulevard in Hollywood. 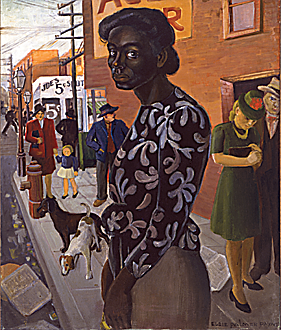 She knew the African-American woman portrayed here, who on several occasions posed as a model for other works of this era. This particular scene captures a period in time when a corner store in Hollywood could afford to sell items for five cents, trash was simply thrown in the gutter or on the street, and dogs roamed free. Although the art buying public did not respond by acquiring scene paintings, a fact exacerbated by the Great Depression, art critics both locally and in Eastern cities wrote favorable articles about many of these works. The fact that these artists were able to capture some attention in the Eastern art community was a big step forward. Traditionally, nearly everyone east of the Rockies felt California had little or nothing in common with mainstream Eastern American culture. To a certain extent, the California Scene Painters broke through those suppositions to form lasting friendships with artists and art dealers throughout the Midwest, the South, and on the East Coast. Artists Emil Kosa Jr., Millard Sheets, Phil Dike, Barse Miller (Fig. 5), Paul Sample, Milford Zornes, and Dong Kingman all had gallery representation and exhibitions in New York City in the 1930s and 1940s. 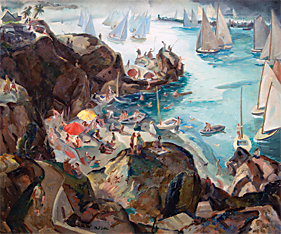 Connected by their choice of subject matter, nearly every California Scene artist developed his or her own stylistic approach to design, composition, and application of the paint. One group of artists, which included Millard Sheets, Phil Dike, Barse Miller, Milford Zornes Rex Brandt and Emil Kosa Jr. (Fig. 6) produced scene paintings with watercolors, and art critics began identifying their work as California Style Watercolors. Typically they worked on large sheets of paper up to 22 x 30 inches, which was noteworthy since most watercolors shown in annual Eastern museum exhibitions were not larger than 12 x 16 inches. Most of the key California Style Watercolors artists also pioneered a new form of paining “wet into wet” by soaking the paper overnight in water and painting on it while still very damp or even wet. The results were beautiful, soft, lost and found edges. The subject matter scene artist chose frequently recorded aspects of California social history (Fig. 7). Works from the Great Depression, for example, reflect great hardships of the downtrodden (Fig. 8), while others reflect the lives of the middle class working society and those who prospered (Fig. 9). Artists embraced all situations since they reflected the social fabric of California. In 1940 Kosa was doing finish work on some murals and decorative panels he previously painted at the Cathedral of the Blessed Sacrament Church in Sacramento. While Kosa worked on the project his wife stayed at a family owned farm house, represented in this painting, located about one and a half hours south of Sacramento in the Central California town of Modesto. This artist was born, raised, and received his art education in Paris, France, but as soon as he arrived in California in the 1920s he was instantly convinced that he had found a very special place, which he considered to be a sort of paradise. His enthusiasm is clearly evident in his large body of work that captures the essence of Southern and Northern California scenes. 22 x 30 inches. Courtesy, Van and Diane Simmons Collection. The Nu Pike was an amusement part in Long Beach, California, and was home to the famous Cyclone Racer roller coaster and the Walk of a Thousand Lights midway section. On the waterfront with a pier extending into the Pacific Ocean, the park was a mixture of circus-type permanent booths, rides and side shows as well as the site of a huge indoor swimming pool, boxing arena, and at least one street lined with tattoo parlors. During World War II Long Beach became a center for U.S. Navy operations in the Pacific Theater and the Pike became a popular place for sailors to hang out. After that time Disneyland and Knott’s Berry Farm took most of the clients who were seeking an amusement park experience and the Pike was eventually demolished. Fig. 8: Ben Norris (1910–2006), Discouraged Workers, 1936. Oil on canvas, 24 x 30 inches. Courtesy Mark and Jan Hilbert Collection. Prohibition had just been repealed when this scene was painted and the Maier Brewery, pictured on the right, was back in business producing alcoholic beer. On the left side of the painting are the holding tanks for the Los Angeles Gas Company. The men pacing along Aliso Street in front of these businesses were hoping to be hired. It was the middle of the Great Depression and approximately 19% of the Los Angeles County population was receiving some sort of unemployment compensation. The Sea, 1934. Oil on canvas, 34 x 48 inches. Courtesy, Mark and Jan Hilbert Collection. Mary Blair, the woman pictured in this painting, is one of the most highly regarded artists to have ever worked in the Hollywood animation film business. She was a superb designer, sensitive color stylist, and talented fine art watercolor painter. She also designed the It’s A Small World Ride at Disneyland and produced murals for Disneyland in California and Florida. Her husband, Lee Blair, is equally well known in Hollywood’s animation business, having worked regularly with pioneer animator UbIwerks and later on many Disney feature films, including Fantasia. He was also a key member of the group that developed the California style of watercolor painting. This painting was produced on location in Palos Verdes Peninsula, west and south of Los Angeles, where Lee and Mary were having a picnic and enjoying a spring afternoon along the coast, one of their favorite weekend getaway places. This work was inspired by freeway overpass construction in downtown San Francisco. Potter was a native California artist who traveled to Paris to study Cubism at the Academie Frochet with Jean Metzinger and Albert Gleizes. These two men were pioneer Cubists and in 1912 wrote the book Du Cubisme. Potter also studied with famed cubist painter Fernand Leger. After returning to San Francisco he applied what he had learned to producing abstract California Scene Paintings. 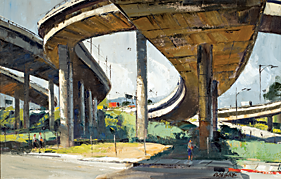 This work was part of a series in which he visually documented the redevelopment and freeway construction projects along the Embarcadero section of the city. The first freeway in California was built to serve traffic flowing between Los Angeles and Pasadena. That short stretch of freeway eventually became the end of the 110 Freeway running through the center of Los Angeles from Pasadena to San Pedro. This is a highly traveled freeway that makes it possible for traffic to flow slowly but surely through the region. This particular painting captures a scene located along the 110 near where it meets the 10 Freeway in Downtown Los Angeles. Hulett was experimenting with pallet knife painting when he produced this work and was inspired by scenes of the downtown area as it was being redeveloped. He was also interested in creating bold shapes and dramatic stylized patterns inspired by these huge concrete elevated roadways. In the early 1950s, California was committed to becoming part of the space age; seminal programs for developing guided missiles and outer space development programs were established in Downey and in the surrounding communities. At the same time, Disneyland developed Tomorrowland, while innovative furniture designers and architects ushered in the modern age of design for home living. In response to these changes, California Scene Painters began producing more abstract works to capture the feel of this new era. In many cases they employed geometric stylization ideas, many of which were inspired by Cubism and Futurism (Fig. 10). This not only gave these mid- century California Scene paintings a fresh, modern look, but since a number of these artists were innovative designers, it gave them the opportunity to create in a whole new way. This style also was quite popular for younger scene painters of the 1960s and 1970s. The West Coast beatnik culture and the rapidly growing California beach and surf culture of the latter half of the 1950s were all reflected in the work of California Scene Painters. Another impact of the time was the development of the California freeway systems that allowed artists to quickly travel to beaches, mountains, deserts, and farmland. The huge cement sculptural freeway forms that serve as automotive overpasses themselves became inspiration for artists such as Emil Kosa Jr., Ralph Hulett (Fig. 11), and Ken Potter (fig. 10). Many other aspects of what has become known as the California car culture, with its drive-in movies, restaurants, and other services, also became subjects. With the 1960s, greater numbers of scenes portrayed the California surf and hot rod culture, along with the jazz scene and the hippie movements in San Francisco and Los Angeles. Motorcycle gangs, riots on the Sunset Strip, and the Watts Riots were all material for California Scene Paintings. New realism, or Photo Realism, became the trend in 1970s and 1980s. Those who continue to produce California Scene Paintings today maintain the interest to visually document aspects of everyday life in California culture and history. Gordon T. McClelland is a prolific author and art exhibition curator who resides in Southern California. He co-authored, with his son Austin David McClelland, California Scene Paintings, available through Amazon.com.